In recognition of the many achievements the society has secured in the last few years we have recently been presented with Wirral Borough Council’s Civic Award. The ceremony took place on 5th March in the splendid surroundings of the Round Room at Wallasey Town Hall and to mark their special contribution to the society’s work Brian Sinton and Rob Dolphin dined with the Mayor of Wirral before being presented with the award. Also, their names will now be recorded on the rollcall of previous winners which includes Olympic champion Chris Boardman, former Tranmere Rovers player and manager John Aldridge and country music legend Charlie Landsborough. Brian has been a loyal member of the society for 10 years and apart from leading the onsite volunteers he has been instrumental in bringing corporate volunteers into Flaybrick. In addition, he has obtained tools and the smart fleeces and polo shirts that have given the society a real identity with the public. Rob has been a member since 2016 and in that time he has become a trustee, a very effective walks leader, re-drafted our constitution, obtained our brown tourism signs, organised our blue plaque event and has been an active member of several small project groups formed to create this website, produce the group’s new publicity brochure and organise and deliver in November 2018 the first remembrance service held at Flaybrick in over forty years. I am really pleased to pass on the society’s congratulations to Joy. This considerable honour is in recognition of over 70 years work in furthering the cause of conservation in the Wallasey area. She was instrumental in setting up one of the first conservation areas on the Wirral in Wallasey. Apart from her local work she has sat on Wirral wide conservation committees attending countless meetings where she always sought to encourage all those involved in the cause of preserving the Wirral. Part of that work was fighting for the cause of Flaybrick. As far back as the 1980’s she took photographs that were to prove invaluable in planning the conservation of the chapel fabric. She joined our society in the mid 90’s and has been a trustee since 2004. The 90’s were a very difficult time for me as there were few people willing to help the cause then and I always appreciated the great deal of encouragement she gave me. In more recent years she still attends our meetings even though she is in her 90’s and has long standing eyesight problems. I have always been impressed by her fortitude. Despite her eyesight problems, which affect her reading vision, she continues to read all the many sets of minutes that she receives from the organisations she supports. In 2005 we were under siege from vandals and needed to pay £145 a weekend for security. I think she paid for two weekends and she continues to give us very generous financial support to this day. I am sure you will all wish her well for her trip to the palace at the end of January, when she will become the third person from our society to be awarded the MBE alongside Valerie Doodson and Angus Tilston. You can read the Wirral Globe article about Joy’s award here. On Sunday 11th November the Friends of Flaybrick organised the first service to be held at the site for more than forty years. The service was held to commemorate the centenary of the end of the First World War and was conducted by the vicar of St James’s Church, Revd. Keith Addenbrooke. A lot of hard work and planning went into the event and we were blessed on the morning by the arrival of the sun shortly before the service began. This after several of our members worked in gentle rainfall from around 8.15 am!! Despite there being so many other similar services around the Borough on the day, we were joined by somewhere in the region of 250 people who helped us commemorate the anniversary. The exhibition which followed enabled more than 100 other visitors to join us after they had attended services elsewhere. The Chair of the Friends of Flaybrick, Val Doodson, unveiled a memorial marking the centenary and wreaths were laid on behalf of the Friends, Wirral Council and 2nd Beechwood Scouts and Cubs who joined us on the day. Thanks for help in ensuring the event was a success go of course to Revd. Addenbrooke and also to E.F Mackie, monumental mason, for the construction of the memorial and Richprint, Wallasey, for their work in the printing of the order of service booklet. Our excellent sound system was provided by Steve from Tam O Shanter Urban Farm and as ever the Friends and Volunteers of Flaybrick Memorial Gardens worked so hard to ensure that the day went well. A final thank you goes of course to the people of Wirral who yet again turned out in large numbers to support all that we do. Wirral’s latest blue plaque has been unveiled at Flaybrick Memorial Gardens in Birkenhead by the Mayor, Councillor Geoffrey Watt. The plaque is in memory of the architects – Charles Lucy and Charles Littler – who designed the chapels inside the Memorial Gardens. The ceremony also involved Peter Bolt of Conservation Areas Wirral (CAW). A number of the Friends of Flaybrick Memorial Gardens were also present, along with members of the public. The event coincided with Wirral Heritage Open Days 2018, Wirral’s biggest heritage event which, every year, aims to give visitors and residents alike the chance to enjoy a rich variety of architecture, landscape and history. The Friends of Flaybrick Memorial Gardens run guided walks around the gardens throughout the year. You can visit their Facebook page – facebook.com/friendsofflaybrick – and their website – flaybrick.org – for more information. 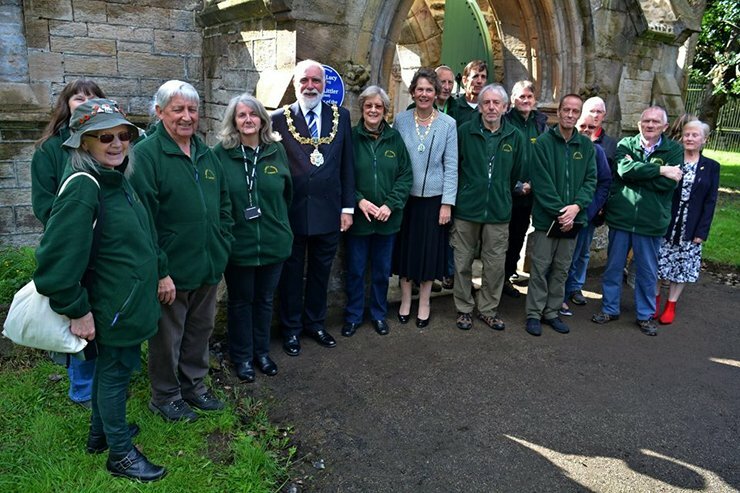 A group of volunteers also carry out work such as clearing shrubbery and overgrown areas and litter picks on the gardens on Thursdays and Saturday mornings from 10am until 12noon. Volunteers meet in the cafe at Tam O’Shanter’s Urban Farm from 9:30am. Do go along if you have some spare time and would like to get involved, or contact the group first if you have any questions. 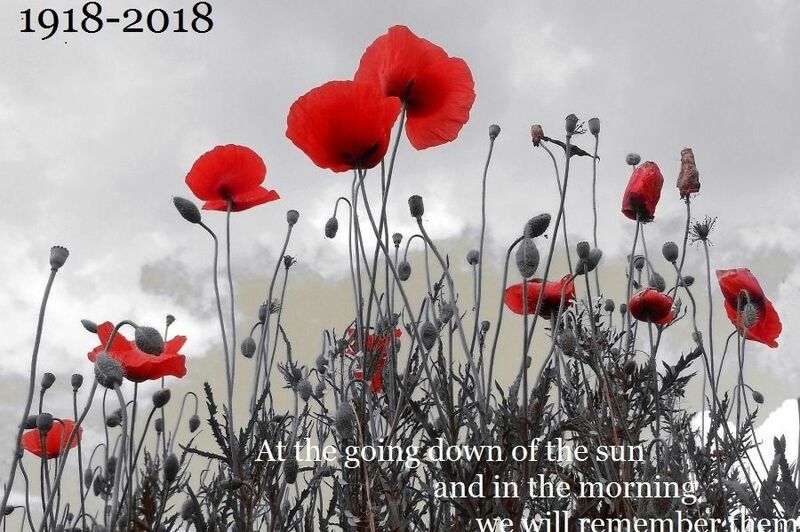 The Friends of Flaybrick Memorial Gardens in Birkenhead are holding their first ever Remembrance Day Service and Exhibition at the Chapels this year on Sunday 11th November. A portland stone tablet has been ordered with local Monumental Masons E.F. Mackie, to commemorate 100 years since the end of WW1 as well as the fallen in Flaybrick. 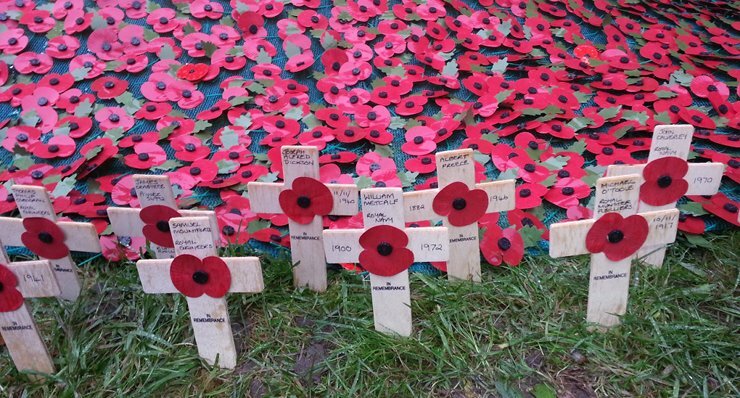 This is to be sited in front of the Cross of Sacrifice and will be unveiled on the day. We are also creating a timeline exhibition of information and photographs inside the Chapels, of the fallen laid to rest in Flaybrick, of which there are over 300. We are currently fundraising to raise enough money to pay for the commemorative stone, as well as the materials to create the exhibition and displays etc. We are also having Order of Service booklets printed for the day. If you would like to make a donation towards this event please visit our Go Fund Me page, www.gofundme.com/ww1-commemoration-at-flaybrick-2018. Just donating a small amount will go a very long way to helping us achieve our goal and the Friends would like to thank everyone in advance for their donations and support. This event is extremely important to the Friends group and those who have relatives resting in Flaybrick. We’re inviting people to come for the Service on the day and to join us in paying our respects to those who should and always will be remembered. We will post more information and photographs as we lead up to the event. Another rain free walk… Just! We enjoyed another fine day although rain had threatened when walk five of our season took place on Saturday 11th August. Yet again an excellent turn out of thirty five visitors were shown around the gardens and had another chance to look inside the chapels. 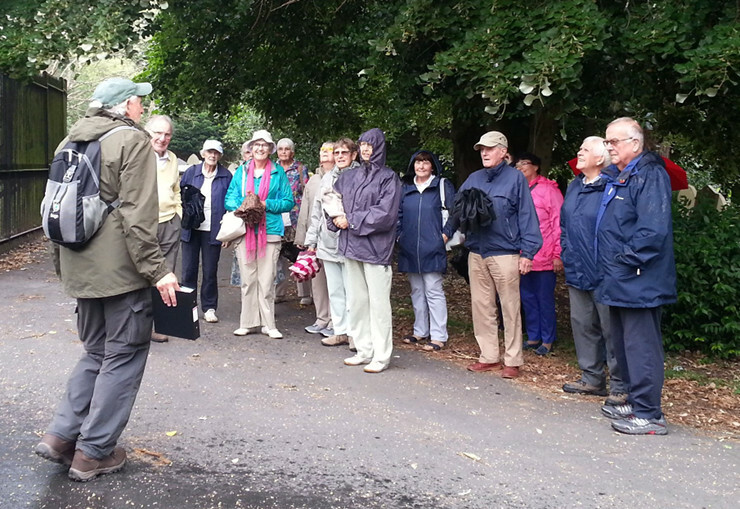 During this walk visitors heard about one of the planners of the D Day landings, a Crimean War veteran and a former Chief Constable of Birkenhead; once again, our resident poet, Terry, entertained the visitors with a couple of his poems. Be sure to join us for our final scheduled walk, which as with tradition will have a military theme, on Saturday 8th September. We will be in the Tam O Shanter Farm from around ten thirty and as usual we will start the walk at 11.00 am. We are also pleased to announce that the Mayor of Wirral, Councillor Geoffrey Watt, has kindly agreed to unveil a blue plaque at Flaybrick honouring Charles Lucy and Charles Littler who were the architects who designed the buildings at the Memorial Gardens. The unveiling will be at 11.30 am on Wednesday 12th September. It’s been a busy period at Flaybrick as apart from our normal volunteer activities, we recently undertook three walks in a single week. Firstly we had the fourth of our monthly walks on 14th July which was attended by 39 visitors who yet again toured the site in glorious sunshine. During the walk and amongst the dozen or so stops, our audience heard about a member of the Laird family, the man who was Birkenhead’s Medical Officer of Health for 28 years and Sir William Jackson, one of Birkenhead’s greatest benefactors. There was again of course the usual opportunity at the end of the walk for people to look around the chapels and to talk to our members; a further bonus for visitors was the chance to hear a couple of poems from our resident bard, Terry. 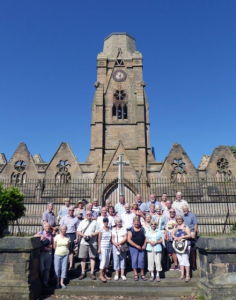 On Monday 16th July we welcomed a small group of members of the Wirral Local History Group who went on our short walk covering the Non Conformist and C of E sections. As we walked around, visitors heard about Lord Evans of Claughton, Edward Kemp, the man who designed Flaybrick Memorial Gardens and Isabel Hunt who was lost when the Lusitania was torpedoed off the coast of Ireland in 1915. Although this is a shorter walk, there were still twelve stops on the tour and the opportunity to see inside the partly restored chapels. Then on Friday 20th July we welcomed 19 members of the Formby U3A and although we saw some rain earlier on, we managed to get around Flaybrick without any trouble. A good number of the visitors had never heard of Flaybrick and those who had were unaware of its importance as a site of such significance locally. The group had an excellent morning with us and were very generous in sending an email after the event thanking our members for the interesting and varied talk they had enjoyed. It was nice that the group organiser took the time and trouble to thank us for our efforts. The fifth event in our monthly guided walk programme will take place on Saturday 11th August; please check our website nearer to the day for confirmation of the details. On 28th June in blazing sunshine yet again, we welcomed members of the Leverhulme Pensioners Association for a guided walk around our parched acres. Thirty one members of the group attended and few had any awareness of the importance of Flaybrick in the history of Wirral prior to the day. We were able to tell them about the beginnings of Flaybrick and talk about a dozen or so of the people resting here at the site including one of the architects who designed the chapels and also one of the founding fathers of Tranmere Rovers. The Friends would like to thank the group for their interest and in particular for the generous donation over and above the standard £2 fee we ask for. For a small charity such as ours, kindness on this scale is greatly appreciated. We are always delighted when people walking around Flaybrick stop and talk to our volunteer group members about what we do and what our plans are for the future. On gloriously hot days such as we’ve been experiencing recently, it’s also a good excuse to have a break and get our breath back! On Sunday 10th June, local community organiser Rob led a group of eight volunteers round Flaybrick Memorial Gardens to undertake a litter pick. This was an entirely voluntary act of the part of the group for which they sought no thanks or attention; their kindness only came to light because our own Rob, who is looking after the guided walks programme for this year, happened to be on site at the time planning the July walk. 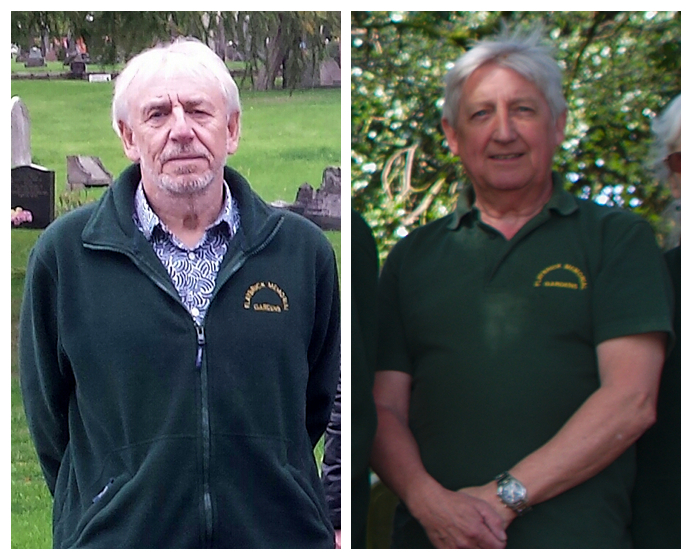 The Friends of Flaybrick are grateful to Rob and his merry men and of course to any other group which may wish to come along to give us a hand to keep the site in good condition. Similarly on 30th June a dog walker stopped to chat as we were working to create the paths around the chapels and seeing that the chapels were open, asked if he could have a look around them. After about ten minutes he emerged and had been amazed at what he had seen. Before leaving to continue his walk around, he very kindly gave us £20 for our charity and thanked us for all that we are trying to do to keep Flaybrick looking good. The support we receive from the people of Wirral is greatly appreciated. Once again we were blessed with beautiful weather for our third walk of the 2018 programme. 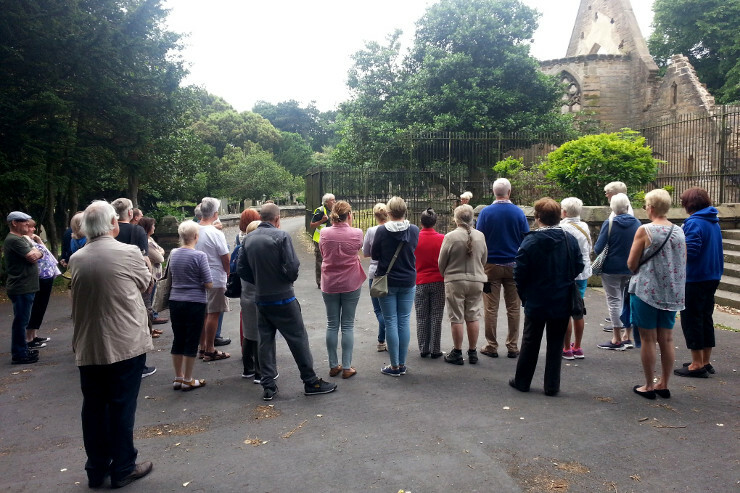 Amongst the stops on this slightly shorter walk around the gardens, the 35 visitors heard about the young North End boy who came across an unexploded bomb with devastating consequences, Birkenhead’s first ever Labour Party MP and the Birkenhead born Bishop of Shrewsbury. The walk finished with a stop at the grave of the man who, more than any other individual saved Bidston Hill for the people of Wirral to enjoy forever as a public open space. As always, the Friends were in the Chapels to show visitors round and to look at the display of old photographs from our archives.